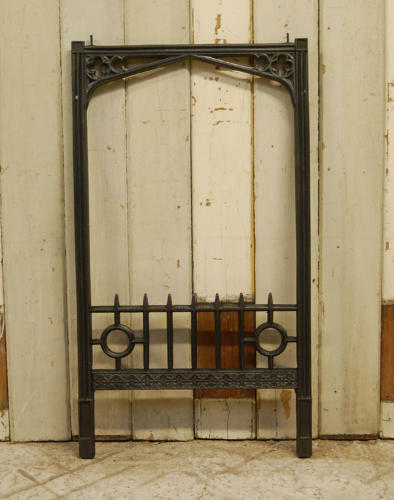 A very pretty, Gothic style, cast iron Victorian fire trim / front. The trim is of a petite size and has beautiful detailing with a Gothic arched opening and flowers, typical of the style. The bottom of the trim has decorative front bars with circles and spiked design, plus pretty flowers below. There are two fixing pins at the top of the trim to slot in to a surround or wall. The trim is in very good, antique condition and has been blacked and polished, giving a rich colour and finish. The back has surface rust as expected. There are very slight knocks and wear to the front due to age. A very pretty item that has wonderful Gothic revival design, popular in the late Victorian era. The fire trim is ideal for a smaller hearth, perhaps in a bedroom, and is a very desireble piece.